We are happy to announce an update for iAudioGate for iPhone which contains stability improvements and bug fixes. Please update your iAudioGate to this latest version. Thank you for using iAudioGate. - Added PrimeSeat to music distribution service view. Support for PrimeSeat hi-res streaming. - Songlist view for each distribution service can now be refreshed by swiping down. - Abolished the real-time conversion setting in Setting View. - Improvements to the playback engine. - Fixed: DSD native playback which could not be used on iPhone X, iPhone 8. - Fixed: songs are no longer displayed in the control center after displaying alerts. - Support for iOS 8 has been terminated. Open the PrimeSeat program view from [More] - [Music Distribution Service] in Hi-Res library, then select the program you wish to stream. * Programs available for iAudioGate are limited to free content. * Streaming playback is effective only when Wi-Fi is used for connection and when [Cellular Data] in [Settings] - [Download / Streaming setting] is off. Please be aware of the amount of data traffic when you use cellular data because of the large data traffic volume of streaming playback. * If you select 48kHz or 96kHz from [PrimeSeat Streaming Speed Limit] in [Settings] - [Download / Streaming Setting], the program displayed will be limited up to PCM 48kHz or 96kHz. 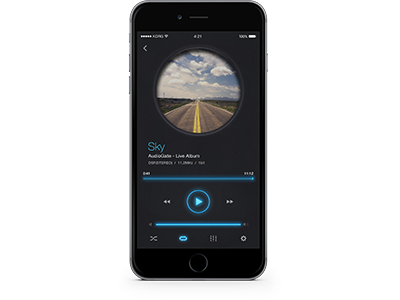 We will continue to develop new functionalities to provide an enjoyable music and audio experience for you. Thank you for using iAudioGate for iPhone! Home News iAudioGate for iPhone version 4.0.0 is now available!